Quick Yeast Rolls - Chocolate Chocolate and More! Quick yeast rolls are a family favorite in our house. These rolls take a fraction of the time that regular yeast rolls take. When it comes to making dinner for my family, I find it a chore. Want something sweet, something yummy and I’m all over it but meat, veggies, boring. So I get lazy. I’ve tried several “quick” bread recipes and well, let’s just say they weren’t up to sharing. Usually, There’s a reason things that take a little longer to make taste so much better. Cakes and Cookies usually are better due to the ingredients used. Nothing beats real butter in a cookie recipe. Sifting the flour for a cake does make it lighter. With breads, it’s time for the yeast to do it’s job, during the rising process, the flavors develop. So I was lazy last week, at dinnertime. I can’t even tell you what I made, I think it was ham. But when I’m lazy like this, I’ll try and have homemade bread or rolls to compensate. I think the only thing I’d change is the size/number of rolls. This recipe makes 12 rolls but they were so big, I could only eat one, next time, I’ll do 15 rolls and maybe I’ll have room for two. Combine milk and butter, microwave just until butter is about 1/2 melted. Pour milk and hot water into bowl of mixer. Add sugar and salt, mix just till blended then add in 2 cups flour. Mix for about a minute, making sure flour is blended in. 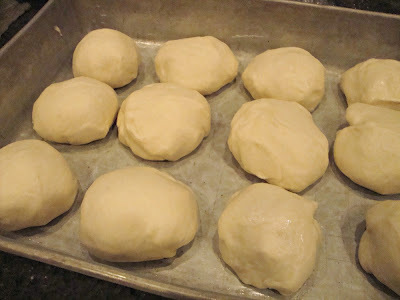 Add in yeast and remaining flour, 1 cup at a time, You want the dough to just be pulling away from the sides of the bowl. Mix for 5 minutes on medium speed. Cover bowl with plastic wrap to keep heat in and let dough rise for 5 minutes. While dough is rising, grease a 9 x 13 pan. Lightly grease your cutting board then turn dough out onto cutting board. 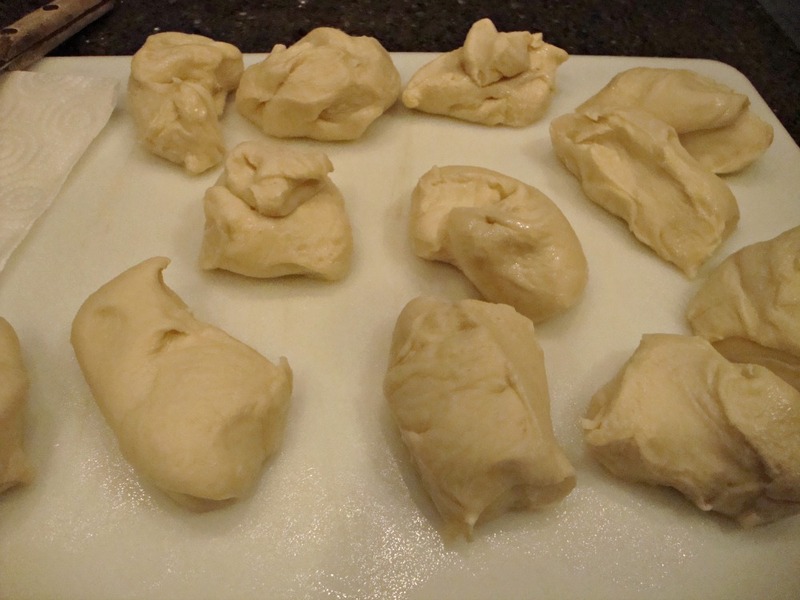 Divide dough with a sharp knife into 12 pieces. Gently shape into a ball, I worked the dough, pulling the sides down and tucking them under. Place dough into your prepared pan. 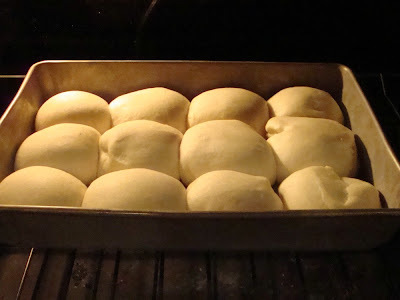 Place pan in a preheated 170 degree oven and let rise for about 20 minutes or until doubled in size. Leaving the pan in the oven, increase temperature to 350 degrees and bake for 15-20 minutes, until tops are golden brown. Remove from oven and brush with melted butter. I’m linking up as some of these great parties and at Yeast Spotting! I REALLY have to get over my fear of yeast! These rolls look amazing! 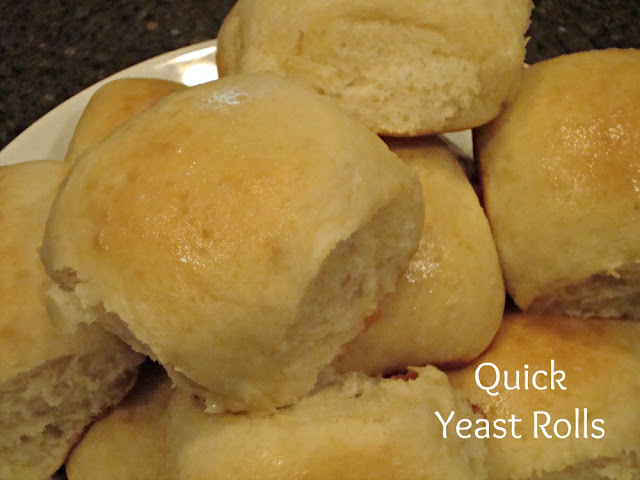 I love a good quick yeast roll recipe! Yours look yummy. 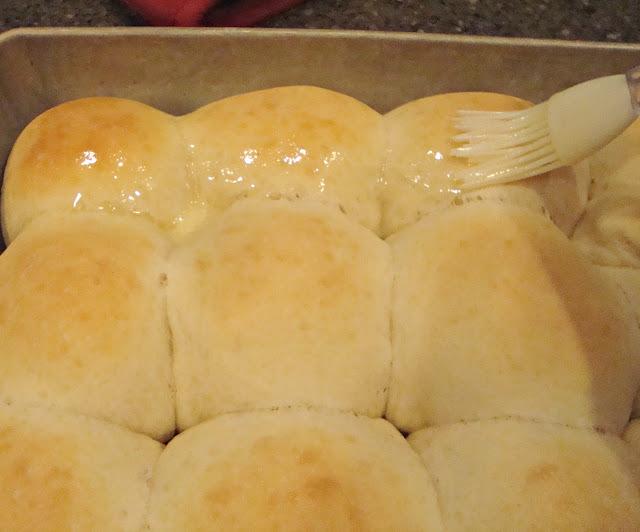 We love our dinner rolls and these look great! Will be trying them out soon! Thanks Joan! Definitely going to try these.. thanks.. fabulous recipe as usual. You sound like my daughter the dessert queen. I’m the opposite making dessert is a big mess for me. thanks for sharing your rolls on foodie friday. These look delicious. I can’t wait to try them with dinner tomorrow. Thanks for sharing!!! These look beautiful! I’m a huge fan of yeast rolls!! Thanks for linking to Foodie Friday! I have made this recipe 2 times now..It is sooooo EASY…I used 2 pie tins and they turn out perfect…They never last more than a day..My family gobbles them up…Thanks for sharing this recipe…It is going in my cookbook of favorites!!!! Hey lady! I just stumbled on your cute blog and I’m your newest adoring follower!! Also I’d love to have you check out a huge Shabby Apple Giveaway I’m having right now! Is instant yeast the same as rapid rise yeast? I’d like to try this recipe. These look so good! Thank you for sharing with us on Saturday Show and Tell. I hope you’ll join us again this week! These are the perfect homemade rolls for a busy family. They rise quickly and then get on to baking! These look as good as you wrote about them. I will try them. I lvoe these, I made them today for Thanksgiving at my parents house, and am making them tomorrow for Thanksgiving at my in-laws house. These are a big hit, everyone loves them!! So glad you enjoyed them Kristen, I’m making them for our Thanksgiving dinner also! Happy Thanksgiving! I’ve made these a couple of times now, and they are so good! The first time I made 12, and they were huge. After that, I made them into 20, 4 rows of 5, in my 9×13 pan – perfect size!